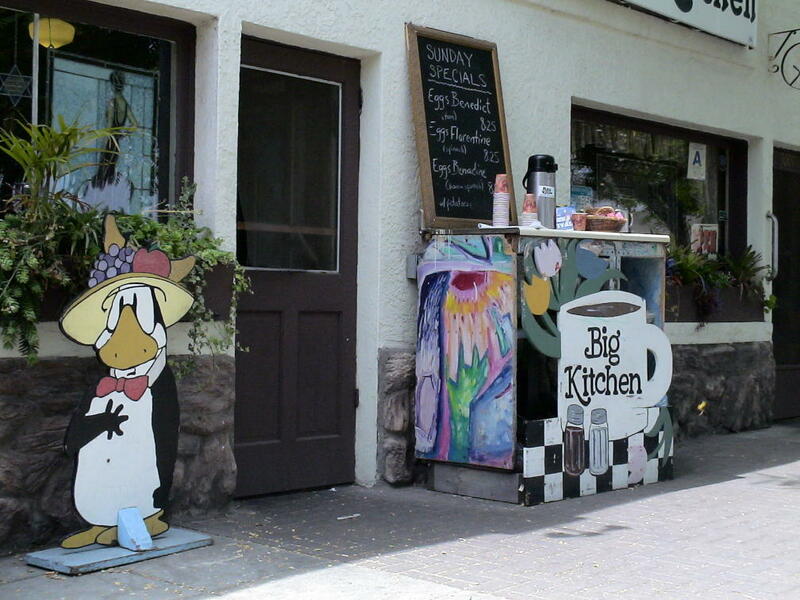 The Big Kitchen on Grape and Fern in the Golden Hill area of San Diego is a big part of the community there; in fact, there are some residents who say that the Kitchen is a reason for the sense of community that exists in the area. Judy (the Beauty), the proprietor, is well-loved in the area, and on her recent birthday managed to receive letters of commendation from as far afield as William Jefferson Clinton. Which says far more about the resourcefulness and loyalty of her friends than it does with any political connections she doesn’t have. They will do anything for her; you will too, if you eat there often enough. The Kitchen specializes in breakfasts. You can get various omelettes, eggs, and pancakes; or fruit. If you’re looking for a real down-home treat, try their biscuits & gravy—sausage or vegetarian. If cholesterol holds no fear for you, get their flour tortillas and butter. Their tortillas are imported from a restaurant in the Barrio, undoubtedly made with real lard. Very tasty. While known for their breakfasts, the Big Kitchen excels at lunch as well. Good sandwiches, chili, and the daily special. And of course their breakfast dishes are served all day. The pancakes. The spicy macaroni. The tortillas, spread with butter. They get their tortillas from a wonderful Mexican restaurant in Barrio Logan, Las Cuatro Milpas. Whoopi Goldberg. Her face is on every wall. She lived in the area when starting out, and was good friends with Judy. They are very proud of her in the Kitchen. Also, this is a breakfast and lunch restaurant: it closes around three, so don’t be late! And on weekends, you are guaranteed a wait in line if you come in for breakfast. You really can’t beat the Kitchen for breakfast, and they serve a mean lunch. Go. May, 2004?! I need to get out there again. Facing each other across Fifth Avenue in Hillcrest, these two great bookstores complement each other well. The Big Kitchen last modified April 1st, 2013.